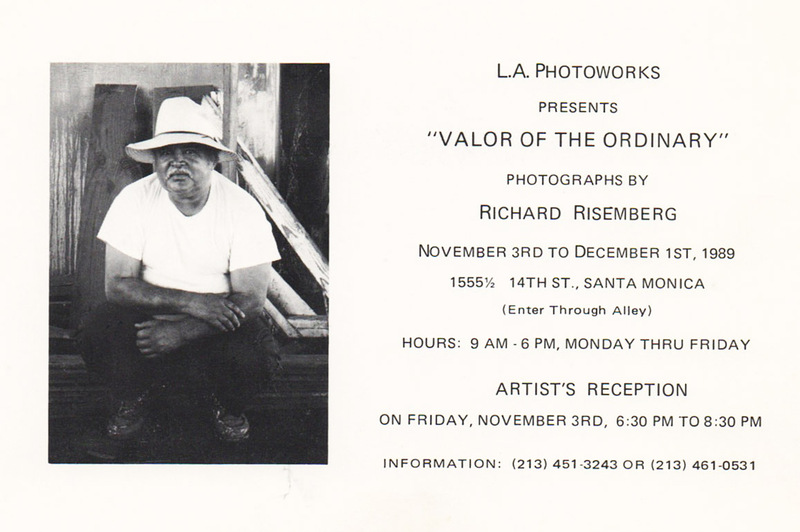 What you see above is a scan of the invitation to an exhibit of my photos that took place ages ago in Santa Monica. The salient portion, of course, is the image: a .jpg of a scan of a halftone copy of the actual print, a portrait of one Antonio Herrera, or perhaps Hernandez. I regret that I don’t remember which; I met the man and took his photo thirty years ago, using a bulky 4×5 inch sheet-film camera, which I had lugged to the harbor at San Pedro just to see what I might find that could be worth commemorating. In the shadows of a highway bridge, under a ceiling of stained girders, I met this man, a working man on break from his job at a nearby warehouse. I speak Spanish (in fact it is my native language), and we started talking. He asked me what I was doing with my impressive camera. I told him that I was looking for interesting things to photograph. He said, “Why don’t you take a picture of me?” And so I did. I also took his address and promised to send him a copy of the final image, which I also did: no cheap printout, but a fine print I pulled on to high-quality paper and finished in a gallery mount. This was back in the days when I was a master printer. I never heard back from him, and yet I trust that he and his family were pleased with my work. The photo may still linger on a wall in some tidy little homestead somewhere in the southern portion of Los Angeles. I hope so. The title of the show was “Valor of the Ordinary,” which was inspired by Antonio himself, his words, his presence, his easy dignity. I aspired to seek that valor henceforth in ordinary things and everyday people as I pursued photography, and I realize now that when I returned to writing fiction and poetry, I continued that quest. I do not write, when writing of people, of the rich, the renowned, the redoutable; I do not describe, when writing of things, the extravagant, the elaborate, the bright. I choose to explore the lost hours hidden in shadow and find the obscure and fundamental passions of existence, the ones that make us what we are, not the ones we make up for an adoring or abhorring public. It took me a long time to learn it. But Antonio knew it all along. And it has become my theme: the valor of the ordinary, the heaviness of empty ticking seconds. I have a lot of stories still to write. I dedicate them to Antonio. Previous Old Wine in a New Bottle….